"If we just did a perfect translation of the physical game, it could work, until it doesn't," studio head of Fantasy Flight Interactive Tim Gerritsen told me in a phone interview. "We're inspired by the tabletop edition of The Lord of the Rings Living Card Game, with many nods, but we're not a one-to-one translation of it." 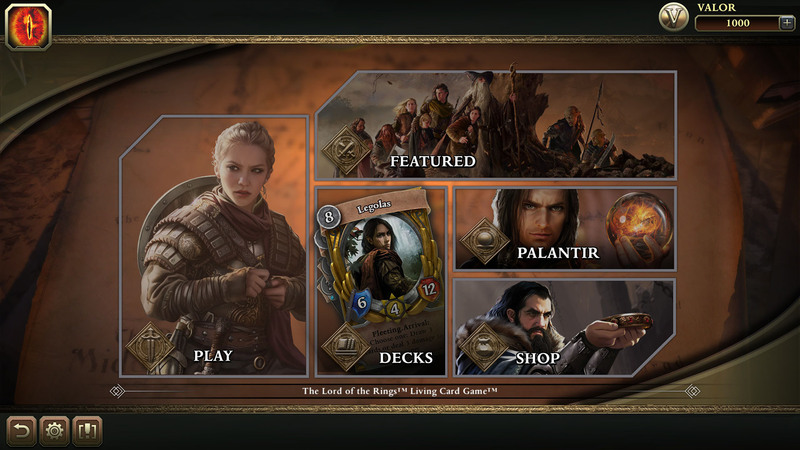 With some familiarity with the card rendition and the LCG concept, I could see that first-hand after viewing a developer demo. It's not exactly the same, but the entire core of the "living" concept, which involves buying pre-set cards and no blind boxes, is going to appeal to a lot of people. Upon viewing the game's storefront, I saw a lot of similarities to Hearthstone. Card backs, valor points (which are essentially the coin currency of LOTR LCG), and quests that mirror adventures are all familiar aspects of Blizzard's popular card game. Yet, LCGs predate Hearthstone by about a decade, and the LOTR version actually came out in 2011. The big difference is that you can buy whatever you want outright. Packs will show exactly what's in them before you buy them, include detailed information and a general breakdown. Players will also earn Valor points by playing the game, and you can either get the cards you want from hero packs, or directly with Valor. There's another huge unique selling point for this project -- it's built entirely on the concept of co-op, just like the tabletop version. Luke Walaszek, Community Manager for Fantasy Flight Interactive explained it best, stating: "Players might see that other cards are in play and want them, but they aren't required, and there won't be a certain meta that you need to chase each season." It's a relief, because the chill aspect of playing PVE/co-op games has appealed to me since I walked into my first raid in World of Warcraft years back. Based on the first few missions I was able to witness in a live demo, I saw a variety of strategies play out in front of me. The gist is that each hero can attack once, and has attack stats (damage), willpower (objective), and health (hitpoints) attached to it. Attacking an enemy "exhausts" it, but you also take damage based on their attack stat (just like Hearthstone). 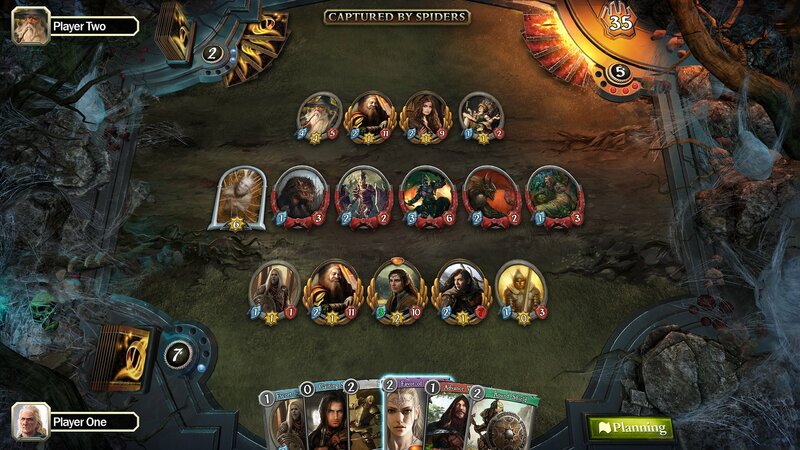 Players will be competing against Sauron, who has his own deck and AI rulesets that change quest to quest. 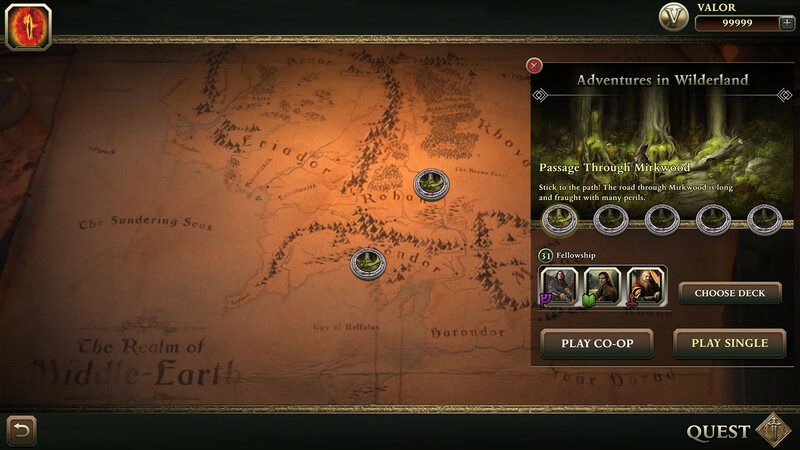 The first objective involved a journey through Mirkwood, with Aragorn, Gimli, and Elrond in tow. Aragorn's power is re-activation to take another action, Elrond can heal at the start of each turn, and Gimli gets stronger as he takes damage. You have to use these powers, plus minions and buff cards from your deck (that you can customize from your library), to take down Sauron. Just like the real thing, this game is brutal. Even the developers had some trouble with the first few quests on normal mode, as you'll need to complete several locations in succession to complete a quest -- if you die, you start all over. Like any challenge in life, even though I wasn't playing the game directly, I could feel that sense of accomplishment after you conquer a set of these challenges. Watching it made me want to play it, which is a great thing. I was able to break down exactly what Fantasy Flight's plan is for the Steam version, and it seems like a simple enough concept to follow. Early Access will have one campaign, with another to follow in the full release, and one more each quarter. Campaigns include five quests, with three to six locations per quest, making them rather meaty. Each campaign will include the first quest for free, and the rest can be purchased. Quests mostly mirror the tabletop version (which take place between Bilbo's 111th birthday and when Frodo first leaves The Shire), but will also veer off course every so often (part of that "different" mentality I keep mentioning). Although Early Access is a standard paid entry type deal, when the game actually arrives it'll be free-to-play. Players can expect to unlock the "core set" 42 cards (21 uniques, doubled), as well as the core heroes of Arwen, Frodo, Aragorn, and Gimli. Because it's a co-op game, Fantasy Flight Interactive is banking on players replaying these massive campaigns to find the best possible deck and go score-chasing. There are also three difficulty settings to choose from, which will influence the amount of actions Sauron (again, the AI) will be able to use in any given turn. The developers are also toying with the "Nightmare Deck" concept from the tabletop version, which would make things even crazier. There are going to be a few Hearthstone comparisons at first, but so far, The Lord of the Rings Living Card Game has differentiated itself from the pack. 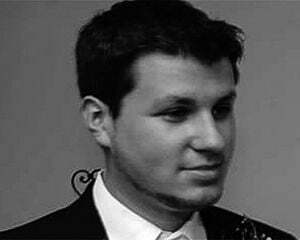 I hope the LCG concept takes off, because I'm really tired of the industry standard of gambling on cards. Although Fantasy Flight Interactive is keeping what's next close to the chest, there's plenty of other LCGs with recognizable franchises in the mix, including Star Wars, Arkham Horror, and Game of Thrones. Asmodee Digital, who has been working on a ton of digital conversions recently, will be handling publishing duties.